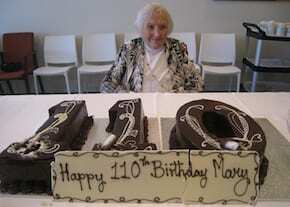 Mary Rothstein, Australia’s oldest Jew, passed away on Tuesday, aged 110. Mrs Rothstein, who was also the second-oldest Australian, died on Tuesday afternoon at Gary Smorgon House, an aged-care facility run by Jewish Care in Melbourne. Her funeral is scheduled for Wednesday. Born in Russia in 1901, Mrs Rothstein and her family escaped the pogroms to England. She lived in London for half her life, working as a milliner making hats for the Queen Mum as well as other members of the Royal Family, before emigrating to Australia, where she worked at Myer department store in Melbourne. She said her mother only ate in kosher restaurants, never drank tea or coffee and used to walk to synagogue every Saturday until she was moved from into the Jewish Care home. Mrs Rothstein was not the oldest Jew in the world, according to Robert Young, a senior researcher at the US-based Gerontology Research Group. “The oldest verified Jewish person is currently Evelyn Kozak of New York City, who was born August 14, 1899,” he said. She is survived by her daughter, two grandchildren and six great-grandchildren.